Currently, there are three programs in Canada that are recognized and accredited by the International Federation of Orthopaedic Manipulative Physiotherapists (IFOMPT). CAMPT monitors these education programs to ensure they meet the standards of IFOMPT. Two to three years on-line and on-site program conducted as learner is working full time. Emphasis on applying advanced clinical skills, evidence-based practice, outcome evaluation in advanced clinical reasoning in OMPT. Clinical courses will be facilitated or mentored by leading Canadian experts or CPA certified clinical specialists. Assignments and OSCE that align with Physiotherapy specialization processes. Individual research projects with opportunities for first authorship. 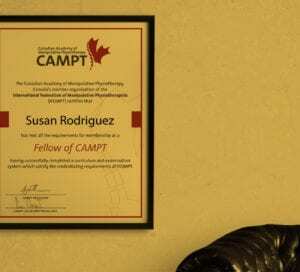 Once you have completed one of these programs, you can register to become a fellow of CAMPT and realize the benefits of the CAMPT-Certified program. Identify, understand and treat a wide range of injuries and diseases. To use hands-on assessment and treatment techniques which can improve accuracy and results. To integrate research into assessment and treatment making treatment and results more consistent. To think globally about injuries including what it does to function AND the impact on daily life. This means not just walking, driving and sleeping – but how it impacts family, work, financial income, hobbies, social and public responsibilities, emotions, relationships, stress… and more. Think globally about diseases not just be focused on what hurts, but what led to the pain, what healing and recovery can be expected, how long healing will take, what the impact will be long term on joints, nerves, organs, balance, coordination, medications… and more. To perform joint manipulations as a treatment technique.